A good, strong, and effective call to action is one of the hardest elements to successfully incorporate into a webpage. You have to be direct, appealing, confident, smart, and concise all with just a few words. Strong verbs and careful word choice can drive conversions to any business. But the space around the words is just as important as the words themselves. These design elements can include any number of successful call-to-action strategies, including design, color, single-click buttons, form submissions, secondary buttons, and more. These five companies have stellar calls to action that embody what the company does, the reputation they strive to create, and how the customer fits into their plans. Those three basic elements — plus a little elbow grease — make them surprisingly effective. Spotify is a music-streaming colossus with millions of users and a track for growth that makes it an increasing threat to its competition. Their service options are pretty simple — free use, which includes ads, and premium use, which doesn’t have any ads. Either way, Spotify gets paid, but they want customers to convert to their premium package. And that’s exactly what they try on their homepage. Instead of encouraging signups, the first thing you see on Spotify’s homepage is their call to action to drive premium subscriptions. Their special deal changes every once in a while, but the point, as with every call to action, is just to drive conversions. Spotify’s call to action does a lot of things right: The color scheme is simple, the background photo is relatable, the color is eye-catching, and the subscription button is easy to find. However, the ad itself is pretty busy for a call to action. Their strategy is working, which is remarkable since it can be hard to focus on a page that has so much happening in such a small space. The background image already features a beach, a visually-busy sweater, and varying color hues. The foreground has clear and easy-to-read text, but it’s accompanied by jagged whitespace that stabs into the ad itself. Still, you can’t argue with the results of Spotify’s overall strategy. It has led to incredibly quick growth over the past several years as Spotify contends for market share that is largely dominated by its competition. But just because Spotify is experiencing growth from its calls to action doesn’t mean they’ve found the only possible solution. In fact, the exact opposite approach can yield similar results. Medium is an open article network that allows users to write content, publish it on their site, and share it with other users. It’s similar to WordPress, except the users have a centralized location where they can view the posts that others have made, and the content is often more news-oriented than blog-oriented. Since the content on Medium is user-generated, they always need new users. Their call to action reflects that while also crediting the idea that — sometimes — less is more. This call to action isn’t front-and-center either — it’s off to the side of the page, and the user-generated content dominates the body. The call to action is actually a part of Medium’s sidebar, which includes featured tags and popular stories. And while it may not feature many eye-catching colors, the grapefruit-colored accents stand out against the neutral coloring of the rest of the page. It’s not much, but it works. However, the fact that their call to action is so small may help explain why there are three other ways to sign up and become a user on Medium. All of these buttons (except “More options”) take you to the same sign-up screen. But Medium’s business model is based on user-generated content, so they might as well take the time and space to appeal to as many potential users as possible. After all, when you cast a wide net, sometimes you get an old boot, sometimes to get fish, and sometimes you get gold. 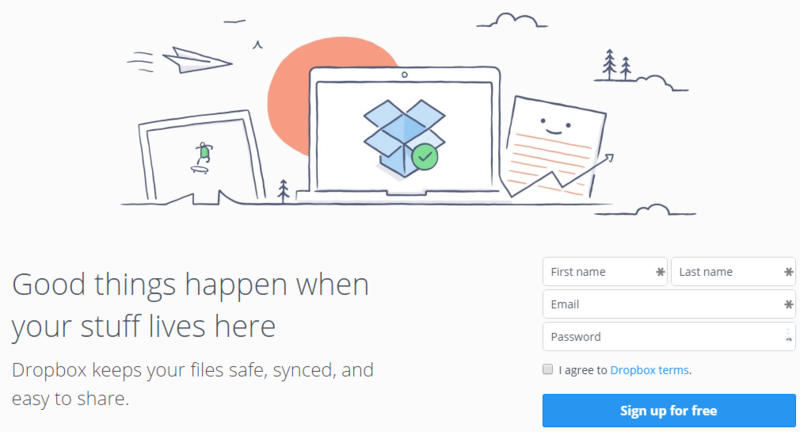 Dropbox is one of the leading names in cloud storage for personal and business use. They’re also known for using unique calls to action that you won’t find anywhere else online. With that in mind, it makes sense that their current call to action continues the trend. While it might be unconventional, Dropbox’s 400 million users are proof that their calls to action work. However, in terms of directed action, it’s pretty vague. But it segues into the form submission seamlessly, listing the benefits of using Dropbox before asking you to sign up — for free! And it might be a little wordy, but the use of whitespace makes the whole page feel as open as the mountain scenery that’s drawn on it. You can practically feel the breeze. Hipmunk specializes in turnkey vacations — basically, you can set up your flights, hotels, and everything else you need in one simple swoop. On top of having one of the cutest mascots in air travel, their call to action is perfect for what they do. Their call to action is a form submission, but the form changes depending on what you need. Oddly enough, this is one of the few companies that doesn’t ask visitors to make an account with them, which means Hipmunk is depending entirely on user experience to drive their signup conversions. It also means that they’re not as focused on return customers as other websites, which makes sense — there aren’t a lot of people who want newsletters about flights, and most vacationers can only afford time off from daily life every once in a while. Specific to its business, the Hipmunk call to action shows that the company knows their primary demographic. Plus, the added imagery of palm fronds, clear skies, an airplane, and their intrepid mascot is a great use of calming, relaxing color. Judging from their call to action, Hipmunk wants potential customers to feel comfortable because that’s how you should feel on a trip. Lots of people have fears that revolve around flying or heights — the safer and more comfortable you can make them feel, the more likely they’ll be to buy. Plus, who could be worried with that little guy in the cockpit? Square is a highly-profitable frontrunner in financial processing software, particularly for small businesses that either don’t want or can’t afford a unique financial infrastructure. Their business model is simple: Create tiny credit card readers, plug them into mobile devices, and transfer funds wirelessly from a simple app. Square’s call to action includes all of those elements, including the small business aspect, to drive conversions. Like Hipmunk, Square opts to use neutral, calming colors as the backdrop to their product. Unlike Hipmunk, Square also includes elements of productivity. The eagle-eye view of coffee shop supplies clearly shows a business that’s working hard — clean, but working hard. Plus, you’ve probably seen a place like this on the corner by your work. It’s every local coffee shop, and that’s a huge part of Square’s business. From the hard-hitting, youthful-explosion design of Spotify to the calm, diligent layout of Square, these five calls to action absolutely nail their primary demographics for driving conversions. They may not do everything that a call to action is “supposed” to do, but the key point is that each design is the best fit for the company. If Hipmunk used red — a color that excites and alarms — as the dominant color in their call to action, they’d almost definitely sell fewer tickets since no one wants to be on edge inside a plane. If Dropbox tried to spruce up their design with loud imagery and in-your-face graphics, site visitors would wonder why a data storage firm is acting like an MTV commercial. 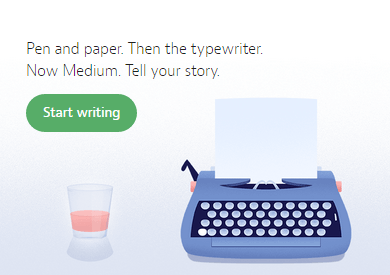 And if Medium just said “Sign up” instead of “Start writing,” they wouldn’t appeal to the content generators that they need for their site to succeed. When you’re making a call to action, you don’t necessarily need the advice of experts — you need to figure out what best represents your company to your niche demographic. Once you have that nailed down, it’s a simple task of A/B testing to optimize your conversions. And after that, you can sip a cocktail while you watch your conversions climb. What are your favorite calls to action? Have you seen any that take a risk, but still succeed? Let me know in the comments!